The Warlock Will Bring the Fire, Ice, and Lightning to the Party in Etrian Odyssey V: Beyond the Myth. There are a lot of monsters that call the Yggdrasil home. Sure, cold hard steel and explosive gunpowder can usually get the job done, but sometimes a little more "oomph" is required when dealing with these pesky beasts. Thankfully, the Celestrian's Warlock class provides a magical spark to these engagements. And when we say spark, we actually mean ancient power that can summon raging fireballs, monstrous hailstorms, amplify other magical abilities, and more! As they level up, Warlocks can further specialize in base elemental skills (fire, ice, and lightning) or branch out to learn new elemental earth and wind spells. The Bufu Boyz are back and ready to celebrate the 10-year anniversary of the Etrian series! 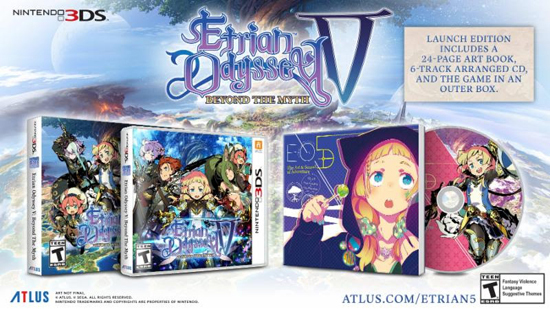 ATLUS' own Will and EJ will continue to stream their misadventures in Etrian Odyssey IV: Legends of the Titan. Tune in this Friday (Aug. 4) at 2:00 PM PDT for your chance to win some prizes and watch them navigate the perilous dungeons! A Choose-your-own-odyssey Feel - Starting with the creation of your party to exploring the uncharted labyrinth of the Yggdrasil Tree, Beyond the Myth is all about choosing how your own adventure unfolds. Test your survival skills by wisely navigating the winding floors of Yggdrasil, using shrewd tactics when battling gruesome beasts, making the right decisions during various "scenarios," and more. To meet these challenges, the home base city of Iorys is ready for all your buying/selling, recruiting, and information-gathering needs! Gameplay Fit for a True Pathfinder - It wouldn't be an Etrian Odysseygame without the life-or-death need to map your progress. For those new to the series, the bottom screen of the 3DS displays a top-down, tile-based map that must be filled out while dungeon crawling. Players can use the map to mark the locations of treasures, doors, enemies, environmental obstructions, and more. Expect the unexpected at every turn--and then make a note on the map so it's not so unexpected next time! Epic Turn-based Battles - There's a reason why no one has ever reached the top of Yggdrasil. Dangerous creatures and utterly terrifying FOEs--high-level mini-bosses, for you newcomers--roam the labyrinth on every floor, so prepare to test your mettle with challenging turn-based battles. Proper planning is a must and balancing strong party composition is absolutely crucial for success. You'll need the right team to unleash Union Attacks and level the playing field! Expanded Character Creation and Customisation - With four unique races, 10 distinct classes, more customization options than any previous game in the franchise, and a streamlined skill tree/class advancement, you can shape a party to whatever your heart desires. A Magical Art Style and Score - Longtime series illustrator Yuji Himukai and renowned composer Yuzo Koshiro return to add their signature magic to the art and music in the game. 24-Page Art Book - Beautiful character art and concept sketches by the illustrious Yuji Himukai cover the pages of this magnificent art book. The unique explorers that will fill up your party are a wonder to behold. 6-Track Music CD - A grand journey is utterly droll without music, so get into the adventuring mindset with an enchanting soundtrack crafted by long-time series composer Yuzo Koshiro! Outer Box - The Yggdrasil and eager adventurers adorn this colorful out box which protects the precious treasures it holds within. 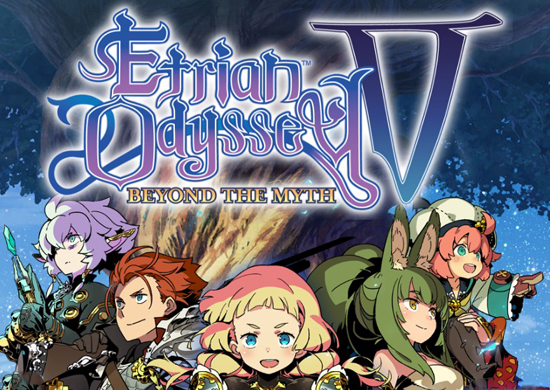 Etrian Odyssey V: Beyond the Myth will release fall 2017 for the Nintendo 3DS™ system and will be priced at $39.99.